U.S. President Trump and North Korean leader Kim Jong Un shake hands at the start of of their meeting at Capella Hotel in Singapore on Tuesday. In a meeting that seemed unthinkable just months ago as the leaders traded insults, Trump and Kim met with staged ceremony at a Singapore island resort. 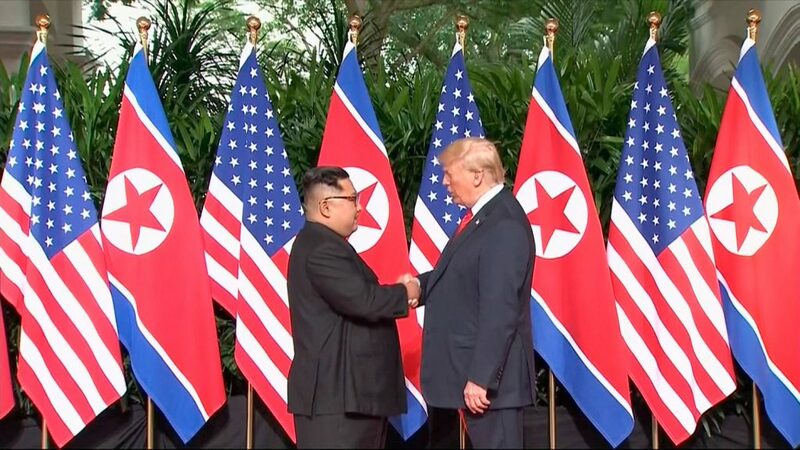 They shook hands warmly in front of a row of alternating U.S. and North Korean flags and then moved into a roughly 40-minute one-on-one meeting, joined only by their interpreters, before including their advisers. Kim said through an interpreter: “It wasn’t that easy to come here. We have a past that held our ankles (to keep us from moving forward). Wrong prejudice and practices have also covered up our eyes and ears. We have come here after overcoming all those” obstacles. The meeting was the first between a sitting U.S. president and a North Korean leader. A lunch meeting with the leaders and their aides featured beef short rib confit along with sweet and sour crispy pork. 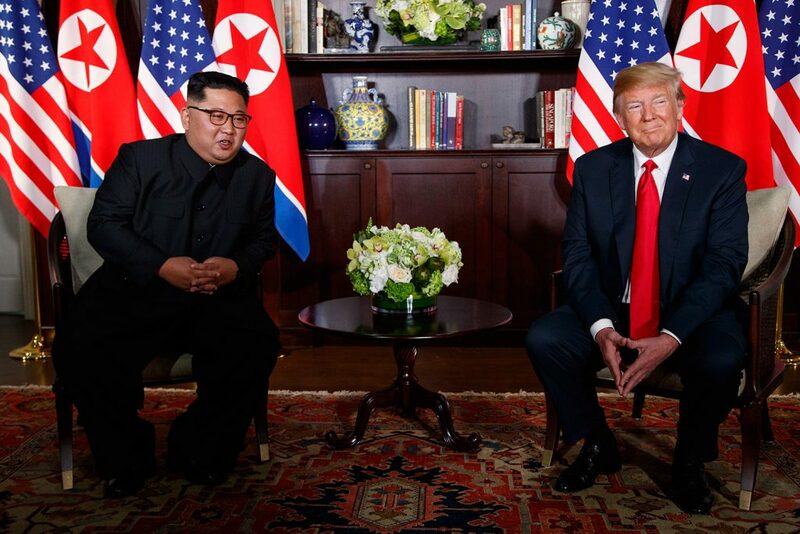 President Trump and North Korean leader Kim Jong Un pose for photos Tuesday during their meeting in Singapore. Trump responded to that commentary Tuesday on Twitter, saying: “The fact that I am having a meeting is a major loss for the U.S., say the haters & losers.” But he added “our hostages” are back home and testing, research and launches have stopped. What does Korean denuclearization mean? As for Singapore, the White House said Trump was leaving early because negotiations had moved “more quickly than expected” but gave no details. On the eve of the meeting, weeks of preparation appeared to pick up in pace, with U.S. and North Korean officials meeting throughout Monday at a Singapore hotel. Less than a year ago, Trump was threatening “fire and fury” against Kim, who in turn scorned the American president as a “mentally deranged U.S. dotard.” As it happens, the North Korean and the American share a tendency to act unpredictably on the world stage. As Trump sought to build a bridge with Kim, he was smashing longtime alliances with Western allies with his abrasive performance at the G-7 and angry tweets directed at Trudeau and sent from aboard Air Force One as Trump flew from Quebec to Singapore.